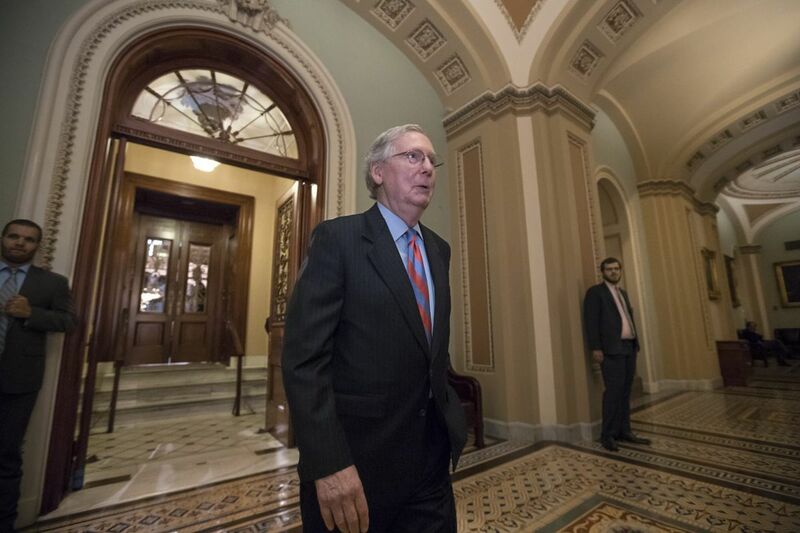 Senate Majority Leader Mitch McConnell of Ky. leaves the Senate chamber after a vote as Republicans remained stymied in their push to repeal and replace Obamacare. WASHINGTON — As Republicans surveyed the wreckage of their plans to dismantle the Affordable Care Act, GOP lawmakers said Friday they cannot afford to miss again when they take aim at their next marquee effort: cutting taxes and rewriting the tax code. "If there's a silver lining in not succeeding on health care, it's probably that it makes it absolutely essential that you succeed on tax reform, and I think most of my colleagues understand that in their gut," said Rep. Tom Cole (R., Okla.). "They just know, politically, they better get something done that they can go home and talk about." Still seeking their first major legislative victory under the Trump administration, Republican leaders signaled that the tax overhaul will be their centerpiece this fall, after a summer recess that began Friday in the House. "Frankly, that's the issue that really floats their boats more than anything else, if we're being completely honest," said Rep. Charlie Dent (R., Pa.). But some Republicans worried that their inability to deliver on their long-held promise to roll back Obamacare could overshadow upcoming work on taxes, critical spending bills, and perhaps more modest health reforms that may hinge on bipartisan talks. "Success breeds success. Failure tends to compound itself. So it makes it tougher," Cole said Friday, hours after the Senate health bill imploded. The seemingly definitive defeat cost Republicans more than just momentum and time. They were also counting on the health plan's spending cuts to produce savings that could be used for the tax overhaul. "It would have been better to do health-care reform first, but it is not a necessity," Sen. Pat Toomey (R., Pa.) said Friday on WPHT radio. "We've got to move ahead on tax reform, that's the key to getting the economy moving again." Many Republicans see the tax code as a complex but less emotionally charged issue than health care — though its intricacies have stymied major changes for more than 20 years and the GOP plans released so far consist mostly of outlines and goals. It was the specifics that tripped up the attempt to repeal and replace the ACA. Republicans hoped they had learned from the health fight. "The lesson is that you've got to get buy-in from all stakeholders before the debate even starts, and that's not how they worked" on health care, said Andrew Roth, vice president for government affairs at the Club for Growth, a free-market lobbying group. "They placed a bill out there after they crafted it in secret and they basically said, 'My way or the highway.' That's not what they're doing with tax reform." He said the club and other key groups have had numerous meetings with the Trump administration and xongressional leaders. Cole pointed to a joint statement this week from the White House and top Senate and House officials that settled one major dispute, a proposed tax on imports, which was dropped. "There's a little more common goal within the Republican Party" on taxes, said Rep. Tom MacArthur (R., N.J.). But one hindrance shows no sign of abating: the daily controversies emanating from the White House. "The neverending drama, turmoil, instability, chaos down the street is not helping anything — it's not," Dent said Friday morning. "All these tweets dominate the agenda and the news cycle and makes it hard for everybody here to focus on the work that needs to occur." A few hours later, President Trump replaced his chief of staff, Reince Priebus, and announced it on Twitter. And it wasn't lost on anyone that two of the three fatal Republican "no" votes on health care came from Arizona's John McCain and Alaska's Lisa Murkowski, senators Trump has personally attacked. Cole said a more visible push from Trump on health care would have built support and reassured jittery lawmakers. Instead, the president used more ammunition on his attorney general, Jeff Sessions, than on health care, and vacillated on strategy and policy. At a speech in front of law enforcement Friday, Trump mentioned the health fight in passing and said, "Let Obamacare implode." Other lawmakers in both parties, however, including McCain, have called for bipartisan negotiations to address the health law's lingering problems and uncertainty in markets. Dent and other House Republicans from the Philadelphia area have been part of bipartisan meetings working on plans to shore up the individual insurance market, repeal the ACA's tax on medical device makers, and "relax" the mandate that employers with 50 or more workers offer health coverage, he said. He had another meeting on those topics Friday. Sen. Lamar Alexander (R., Tenn.), who heads the Senate health committee, has suggested holding hearings that allow input from both parties, and Senate Minority Leader Chuck Schumer (D., N.Y.) said Democrats would be willing to work with Republicans as long as they drop the idea of a drastic repeal. Other Republicans want to continue fighting for a push, which has appeared doomed before, only to be revived. Democrats encouraged Trump to turn to enacting an infrastructure program, warning that tax reform might not be as easy as Republicans hope. "If they do the same thing, campaign one way and then propose legislation another way in favor of the wealthy, powerful few, they'll fail on tax reform," Schumer said. Health care accounts for about 17 percent of the economy, said Rep. Brendan Boyle, a Philadelphia Democrat. "With tax reform, you're talking about touching 100 percent," he said. "And if you're talking about the number of stakeholders that are involved, it increases exponentially, so tax reform is far more complex." But it's a puzzle Republicans will have to solve if they want to score a major victory in Trump's first year.